Kristjan Kangur is in Milano! 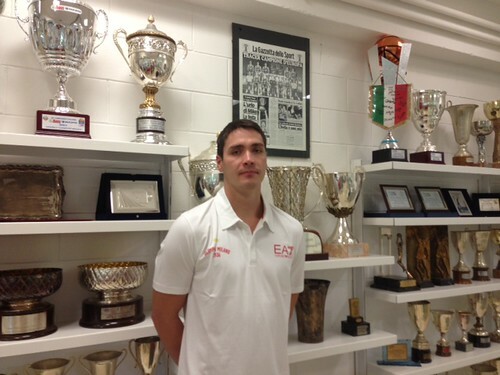 Pallacanestro Olimpia EA7 – Emporio Armani Milano agreed on terms for one year with Kristjan Kangur, a 2.02 mt. tall forward who’s going to be 31 anni late in the next month of October, coming from Mens Sana Siena, of Estonian citizenship. Kangur is already in Milano and will join the team’s training camp in Campo Tures tonight. COACH BANCHI’S OPINION– “Kristjan is the kind of player perfect for adjusting to a team need because of his great experience and knowledge of the Italian league. For that reason I expect him to complete our group in the best way”. WHAT KANGUR HAS TO SAY – “It’s great to be here and starting a new experience, with a new team e new teammates although I already knew David and coach Luca Banchi. Moss has been a great teammate in Siena like he was in Bologna when I first met him. So I’m very excited”. WHO’S KANGUR – Born in Parnu, Estonia, on October 23, 1982, Kangur began his professional career in Tallinn in 2000. He won the Estonian championship in 2002 and 2003, in 2001 he won the national Cup. In 2003/04 he averaged 15.7 points per game and 6.2 rebounds. During the following summer he signed his first contract with a foreign team moving to Germany, at Bayer Leverkusen for two years. In 2006 he returned to Estonia, in Tallinn winning three national cups and one more Estonian championship, in 2009 when he won the Mvp award in the playoffs. In 2009 he moved to France, at Asvel Villeurbanne and he also made his Euroleague debut. During his tay, Asvel won the French Supercup and the national cup. At the end of the season, he signed for Virtus Bologna to play the Italian league playoffs. The following season he signed for Varese, he averaged 9.9 points per game with 5.4 rebounds and was signed by Siena. But he was loaned to Varese again (10.9 points per game, 5.2 reobounds on average). Last year he played for Siena winning the championship and the Italy Cup. He played four European championships with Estonia. He’s been the team’s captain since 2011. NOTES – Kangur has won four league championships, three in Estonia and one more in Italy, he has also won six national cups, four in Estonia, one more in France and another in Italy… In Siena he played along David Moss and was coached by Luca Banchi… In Varese, he played the former Olimpia’s player Rok Stipcevic… In Bologna he played along David Moss again… That’s incredible but in the five games he played for Virtus Bologna in 2010 he was 10/11 from two and 6/6 form three-point range. His Virtus team was eliminated in five games by Cantù in the quarterfinals… Kangur just led Estonia to gain a berth for the 2015 European Championships, surpassing Bulgaria in the finals. He had 8 points and 6 rebounds in the closing game.